Disappointed diner Ewen Cameron, a Scottish DJ and TV host, started a Twitter storm on Easter Sunday when he complained about the burger he was served in James Martin Kitchen at Glasgow Airport. James Martin responded by apologising and vowed to ‘personally’ investigate the meal in question – but the whole episode has clearly resonated with many people around the UK. As a Which? 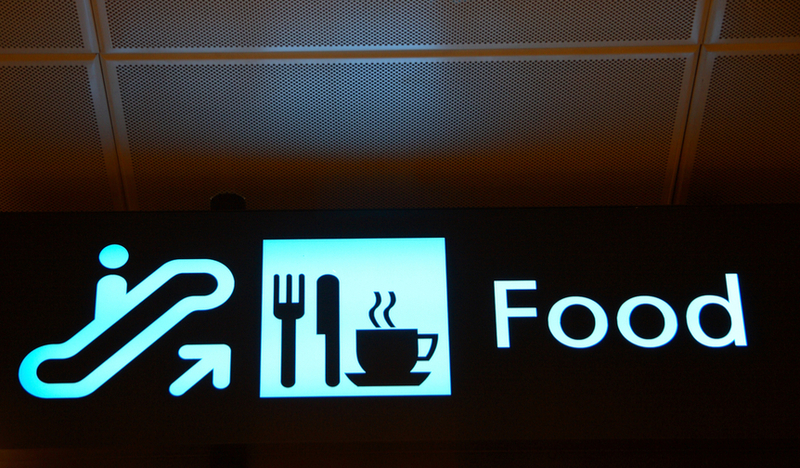 survey found in 2014, overpriced food is in the top 10 of flyers’ frustrations at airports. And it’s not just food: some airport outlets reportedly charge 300% more for a bottle of water than high street prices. And as community member Ivanerlick pointed out, bottled water can be especially expensive once you pass airport security. It’s generally accepted that in-flight food and drink is often massively overpriced – and disappointing on the palate – but why should this be the same with pre-flight meals? True, airport restaurants face greater challenges than their high-street equivalents. Fresh produce can only be brought in at specific times and has to be security screened, there are restrictions on knives and kitchen utensils, and some airports don’t allow gas cookers – but that’s just one side of the story. Limited space in departure lounges means the food outlets have a monopoly over consumers; and they don’t really rely on repeat customers either. This means lower standards can persist across the board in airport restaurants – and probably better explains the poor experiences reported in our survey. Have you also had a ‘truly awful’ airport meal? Should airport eateries be doing more to raise standards? Do you find they charge a lot more for food and drink? This is a guest contribution by Oscar Webb. All views are Oscar’s own and not necessarily those also shared by Which?. If, as seems to be the case, one can not bring ones own food past the security barriers and into the duty free zone, there exists a complete monopoly for anyone serving food there. This creates ideal conditions for a rip off with no come back. Airports over charge because they have a captive audience with no where else to turn and they blame it on high overheads, which is only partially true. If aircraft charge similarly for equally unappetising food, the poor travellers are “stuffed” what ever they do. There doesn’t appear to be an immediate solution, unless the airport, itself, begins to take a pride in what it offers and insists that its food outlets are fair and serve food that travellers wish to eat. They seem to be far too busy sorting out delayed flights and queues. No one should have to sleep on their suitcase. It hurts to see that, even from an armchair far, far away. I’d be willing to accept sub par food at a sub par price. Unfortunately, as Vynor said, airport restaurants can almost operate like a monopoly. They can set high prices as you either have it or go without, it’s not like you can leave the airport to find a substitute good. On another note, the food on a plane can be so bad I cringe just thinking about it! Last time I was at Glasgow airport, I found that grabbing a sandwich from W H Smiths was sufficient for my needs and reasonable value for money. Actually, food prices there seemed to be a lot saner than at either Birmingham or Heathrow, we may have canny Scots to thank for that. Usually, however, if I’m at Glasgow airport, I’ll be on my way to the Seamill Hydro at West Kilbride, so I’ll eat there instead if I can. Other countries have price regulations at it’s airports from Greece to India, is it not time to do the same in the UK? You are trapped .you have to pay their price if you need to eat A similar situation at motorway services if you stop there you pay their high inflated prices for everything More money than sense again maybe ? Off topic, but Tebay Services (northbound) used to be a very nice motorway service area. It doesn’t surprise me in the least that an eating place owned/run by a top chef is expensive and rubbish. I have eaten in 2 Jamie Oliver restaurants and the food was quite dreadful. He has closed down some of his restaurants recently blaming Brexit, but the real reason is poor overpriced food. Royal air maroc inflight meals are disgusting. Chicken beef or fish and u cant tell between either. The rest is cold and the bread always stale. I really do not know how they cook so bad. The cakes are usually nice but the meal revolting. Shame on them.